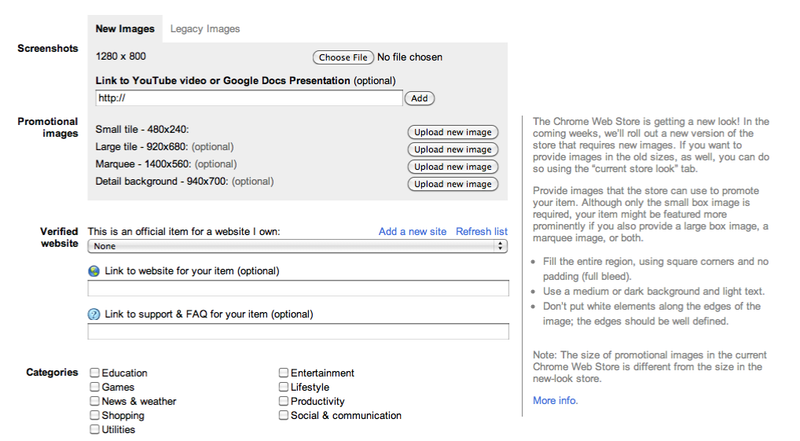 Chromium Blog: Getting your app discovered in the Chrome Web Store with new promotional assets. 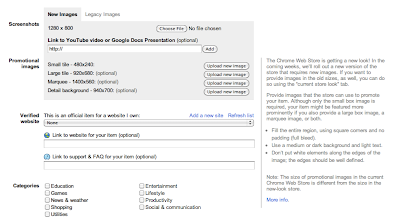 Getting your app discovered in the Chrome Web Store with new promotional assets. , or edit one of your existing items, you'll be prompted to provide us with new promotional image assets. We are asking you for these assets so that we can highlight your apps and extensions in a brand new store layout that our team is working on. (Required) You’ll need to provide us with a large rectangular image to identify your app, in addition to assets you already provide - your app icon and at least one screenshot. (Optional) You can provide us with an even larger rectangular image format as well. The screenshot dimensions have grown larger with a wider aspect ratio. The (optional) marquee image dimensions have also grown larger. To make things easier, we only require screenshots in the new dimensions going forward -- we'll automatically scale them as needed to make them visible in the current store layout. You can read the details about the new requirements on our image guidelines page. If you have any questions on these changes, feel free to reach us at our discussion group. Yesterday we made a small change in Chrome Web Store’s app upload flow: when you upload new apps and extensions to the Chrome Web Store, or edit one of your existing items, you'll be prompted to provide us with new promotional image assets. We are asking you for these assets so that we can highlight your apps and extensions in a brand new store layout that our team is working on.